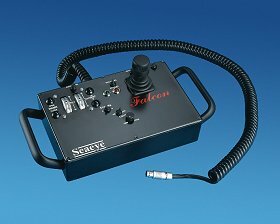 Between 1986 and 2002 when the first Seaeye Falcon was delivered, the company’s focus had been to develop and support a range of ROV systems from the observation class Seaeye Tiger to the work Class Panther Plus for the offshore oil and gas industry and to maintain its leading position in that market by constantly seeking new ways to get more work out of these light, powerful systems. 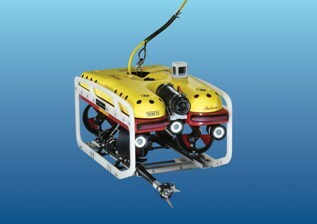 With the introduction of the Falcon in May 2002 the company was to bring the knowledge and experience it had developed in this most demanding environment to other users requiring the professional capability and reliability associated with Seaeye ROVs but in a portable package built to a tighter budget. 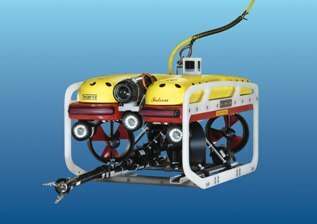 The arrival of Falcon introduced a number of interesting innovations in an ROV of this size and price range including the replacement of the ROV electronics pod with a distributed intelligence control system and new high torque magnetically coupled brushless DC thrusters. Today, Falcon customers include several NATO navies, the Russian, Chinese, Rumanian and New Zealand Navies as well as Special Forces in the Middle East. The ease with which tools and sensors can be added to this modern open frame vehicle without upsetting its performance and stability has also found favour with scientists, environmental groups, civil engineers and deep penetration internal tunnel surveyors. 2003 Colour camera upgraded from 1/3 CCD to higher resolution ½ CCD Seaeye Camera. 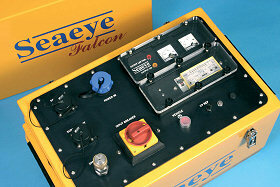 2003 F2 Fibre optic multiplexer upgrade option introduced for Falcon (later to become standard fit in Falcon DR). 2003 Controls for 2 extra lights and camera zoom focus made available. 2003 Auxiliary hand controller introduced to control 2 x zoom focus cameras and aux lights and/or Tritech Laser scaling camera. 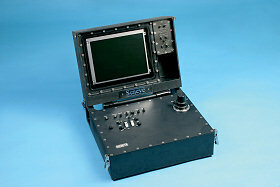 2004 Software provided to control optional second camera tilt mechanism (usually skid mounted). 2004 Software for full/reduced thruster power select switch modified to allow max power to each axis to be individually set in start up routine. 2005 Improved compass provided in navigation pod providing 3x improved accuracy. (Max error reduced from 4 degrees to 1 degree). 2005 Pitch and Roll sensor incorporated. Can be deselected. 2005 Tolerances in thruster gearboxes improved for smoother running & longer life. 2006 1000 metre rated Seaeye Falcon DR introduced. 2006 New, lighter Surface Control Unit introduced with fold out flat screen display, new switch mode supplies housed in a shock mounted military style case. 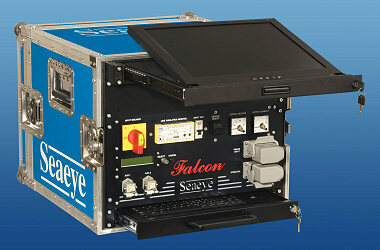 The Seaeye Falcon DR was introduced in 2006 following a number of successful operations conducted by Chris Bryant of Subsea Vision with a standard Falcon upgraded to a specification that would form the basis of the new system. Subsea Vision’s requirement was to penetrate 1600 metres into a pipe line running 600 metres down a mountain side in a hydroelectric scheme. In order to transmit video and data over this length of umbilical it was necessary to add the F2 Fibre optic pack to his Falcon. This had previously been proven in operations to inspect tunnels in Saudi Arabia with a Falcon fitted with inertial navigation and in Falcons fitted with broadcast quality cameras. The F2 fibre optics package provides a fibre optic multiplexer in the vehicle and in the surface unit as well as fibres in the umbilical. It was also necessary for this operation to increase the depth rating of many of the components used in a standard Falcon beyond 300 metres and 1000 msw was chosen. The Falcon DR is rated for operations to 1000 metres to cater for similar operations in deep tunnels as well as for fly away operations in deeper water offshore. 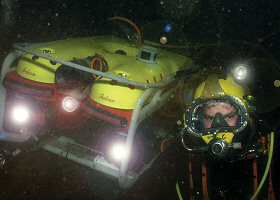 (For regular operations needing a TMS, the Seaeye Tiger may be more appropriate) This Deeper Rated Falcon DR is easily recognised by the thicker red higher density buoyancy material visible below the removable yellow top faring. Another recognisable external feature is the forward facing tilting flood lights that are linked to the camera tilt platform to provide improved scene illumination when filming above or below the vehicle centre line. 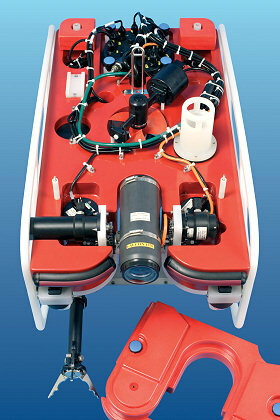 The Falcon DR camera tilt motor and chain drive is the same unit used in the Seaeye Tiger. 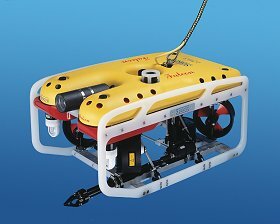 Saab Seaeye pioneered the use of polypropylene in the construction of ROV frames and continues this development with the Falcon. This material is robust, buoyant, easily drilled and machined and is corrosion free. Falcon’s modern ‚open frame‘ design allows the easy addition of standard bolt on accessories including cameras, sonars, tracking systems and a single function manipulator. Custom designed under-slung modules can also be added for task specific tooling. 316 stainless steel fittings are used throughout. The core frame is manufactured using modern composite materials. 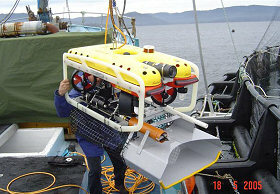 Buoyancy and payload is provided by securing buoyancy blocks of the appropriate depth rating to the chassis below an easily removable hydrodynamic faring. The faring cover also provides protection to electronics housings and cables routed along the top of the buoyancy to the junction box. Mounting points on the vehicle skids are provided for lead ballast to trim the vehicle’s centre of gravity and buoyancy. Brushless DC thrusters have been used on all Seaeye ROVs since 1987 when the company first introduced this technology to the offshore oil & gas industry. These thrusters have drive electronics with velocity feedback for precise and rapid thrust control. A fast PID control system and a solid-state rate gyro for enhanced azimuth stability prevent overshoot on a change of heading as well as helping stabilise the vehicle in forward flight making the vehicle so easy to fly. The open frame and clutter free layout between decks in the Falcon provides the clearest water flow to 4 horizontal vectored thrusters positioned for optimum thrust and control in all directions and superior station keeping in strong cross currents. Falcons are powered by 5 Seaeye Magnetically Coupled Thruster units (MCT1) each capable of achieving 13 kgf thrust at 320W or a combined forward thrust (bollard pull) of 50 kgf. 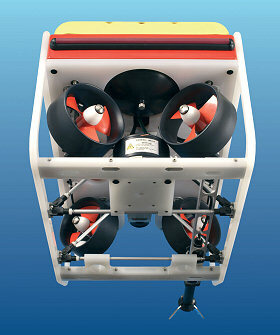 For an ROV weighing only 50 kilos this represents an impressive 1:1 power to weight ratio. 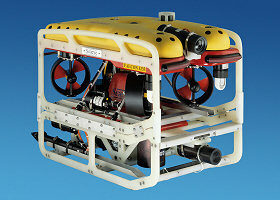 The Falcon is the first ROV in its class to have a distributed intelligence control system. This is a multi-drop network that allows up to 128 devices to be connected together on a single RS485 serial network and to be individually controlled by a master processor. Every controllable device on a Falcon, such as thrusters, lights, camera tilt motor, navigation pod and manipulator pod, contains its own microprocessor and interface and is called a ‚node‘. Each of these ‚nodes‘ is separately addressed on the network and controlled by the master processor in the Surface Unit. Every node is fully isolated to maximise system reliability and each is connected into the vehicle junction box PCB using a common through bulkhead connector. The JB printed circuit board provides each node with its own fused power supply and telemetry. The Junction box also houses the video line driver for Falcon and the F2 Fibre Optic Multiplexer for the Falcon DR that is an optional upgrade for the standard system. This use of distributed intelligence does away with the traditional ROV electronics pod packed with interface circuit boards and frees up space while significantly reducing the weight of the vehicle. Full system diagnostics are provided: A software routine automatically checks each node when the system is powered up and alerts are provided on the video overlay to warn the operator. The full characteristics of each node can also be interrogated individually from the surface unit. Local diagnostics are also provided for each node in the Junction Box with colour coded LEDs confirming fuse and telemetry status. A high resolution fixed focus colour camera is fitted to a camera platform than can be tilted + 90 degrees. An additional switched camera can added to Falcon and is usually mounted on the underside of the camera tilt platform. The F2 Fibre Optic Pack in Falcon DR – (optional in standard Falcons) – provides 3 simultaneous video channels. Panning the camera is achieved by turning the vehicle which it can do within its own length. Two forward facing variable intensity 75 watt Tungsten Halogen flood lights are fitted. An optional additional light can be added. The lights are powered at low voltage, to improve reliability and longevity. In the Falcon DR the forward facing lights tilt with the camera for improved scene illumination. LED lights are offered as an option. All navigation sensors and aids are housed in a single hardened aluminium pod. Auto depth and heading are standard fit with auto altitude offered as an option. A pitch and roll sensor is included and may be selected for display on the video overlay. Single Phase universal auto sensing, self selecting input of 100-270 VAC at 2.8 kw. The Falcon and Falcon DR switch mode power supplies, control system, fold out 15 inch LCD monitor and keyboard are installed in a 19 inch rack mount transport case. The power output from the surface unit to the umbilical is a galvanically isolated 500 VDC supply protected by a L.I.M.All connections to the surface unit are on the front panel for easy access including the hand controller with its 5 metre flying lead. Vehicle Controls on the Hand Control Unit (HCU)IP68 is a waterproof standard providing protection against water ingress following immersion to a depth of 1 metre. This option is particularly popular with military and security users operating from small boats. Single 3 axis joystick for horizontal vehicle control including forward, back, sideways and turn. Rotary trim controller for vertical thrust up or down. Auto pilot function for both heading & depth. The F2 Fibre Optic Pack is standard fit to the Falcon DR and an optional upgrade for standard Falcons. It provides the addition of a subsea and surface fibre optic multiplexer and a suitable umbilical for transmission of video and data over fibre optics between the surface and the vehicle. For the standard Falcon a choice of neutrally buoyant or thinner, slightly heavy umbilical cable is offered. These light weight proprietary jacketed cables offer high abrasion resistance and incorporate a Vectran strength member. For the Falcon DR and Falcons upgraded with the F2 Fibre Optic Pack the following Fibre Optic umbilical is used with a maximum length of 1100 metres (for longer excursions custom designed umbilicals are available). This cable features a tough abrasion resistant Polyethylene inner and outer jacket with a torque balanced vectran braided strength member. Internally this cable has two multi mode fibre optic passes providing 100% redundancy. 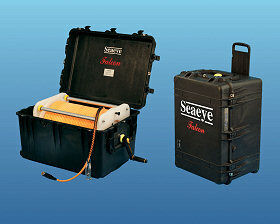 A choice of hand operated winches are available including a compact wheeled Pelican case housed winch that can accommodate a useful 295 metres of 12 mm diameter umbilical. 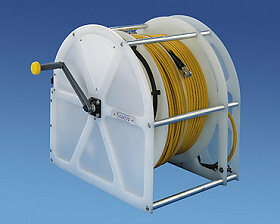 Electric winches are available for the longest umbilical lengths. All have appropriate slip rings to suit the umbilical type.